Keeping in touch as a college student is vital for maintaining relationships with family and friends, keeping them in the loop and weaving your home life with your college life. Reliable ways of keeping in touch, such as texts, emails and chatting on the phone, can get redundant and don’t always provide the best insight into your life as a college student. Instead, spice up how you keep in touch with your family back home. 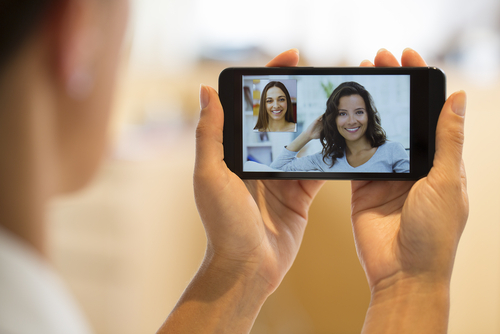 Video chatting with a laptop isn’t new to the scene nor is it the most creative way to keep in touch. Expand your virtual horizons with the iPad Air 2, which is thin and light enough to take anywhere. Video chat with your family at a public park in your new town or while you enjoy a much needed caffeine fix at your favorite coffee shop. Or, your family can video chat you when they all get together for a birthday party or Sunday afternoon BBQ. Although you won’t get a bite of the cake, you can still chat with all your aunts, uncles, cousins and grandparents. With the speed, efficiency and reliability of technology, it’s understandable why snail mail is a thing of the past. Yes, you have to handwrite your letter, buy a stamp, stop at the post office and wait a couple days for your mail to reach its destination, but that’s what makes snail mail fun. The feeling of checking the mailbox and finding something addressed to you that’s not a bill or advertisement is priceless. Sending snail mail to your family leaves them obliged to write you back, giving you something to look forward to in the mail. You also can throw in a copy of the A+ paper you wrote. Snail mail is especially great for grandparents, who typically appreciate handwritten letters the most. A vlog (video blog) is a unique way to show others what a day in the life of a college student looks like. Whether you keep it private for your family to enjoy or you make it a public YouTube channel, vlogging is in. Model one of your vlogs off a cooking show, with a twist on ramen or PB&J sandwiches. Vlog a tour of your favorite spots on campus, such as where you get your morning coffee, restaurants you frequent, the gym and the library. Or keep it simple and just talk straight to the camera about school, your roommates, professors and anything else that’s on your mind. There are so many ways you and your family can share your photos. If you’re looking to keeping it virtual, create a private album on Facebook and make all your family members contributors so everyone can swap photos. Or, use a photo sharing site like Flickr or Photobucket. Take it a step further by sharing developed photos (yes, people still develop photos). Throw just a few photos into that letter you’re sending, or use an app like Groovebook to upload all of your photos for just $2.99 (college budget approved) to send your family a keepsake photobook. A private family Facebook group is great for quick life updates, such as acing that Calculus exam, or for sharing links to YouTube videos with each other. Having your family in one Facebook group creates a forum full of sharing, likes and comments between the people that matter the most to you. For those statuses or photos you can’t share with your entire following, a private group lets you share your silly selfies or embarrassing stories with those that will love you no matter what. Author Bio: Destined to be an Armenian housewife perfecting her hummus recipe, Natalie Posdaljian instead chose a life of marine field biology and sriracha. Born and raised in southern California, her veins rush with salty seawater and sunshine no matter where she goes. When she’s not saving jellyfish from extinction, Natalie is dancing in the shower, knitting on a plane or swinging in her hammock. Going to college? Give yourself the gift of good grades with The Secrets of Top Students! Order Now For Better Grades! Music and Learning: Why Is It Worth Integrating Music into the Classroom? Top 10 Learning Techniques: Which Are Most Efficient?